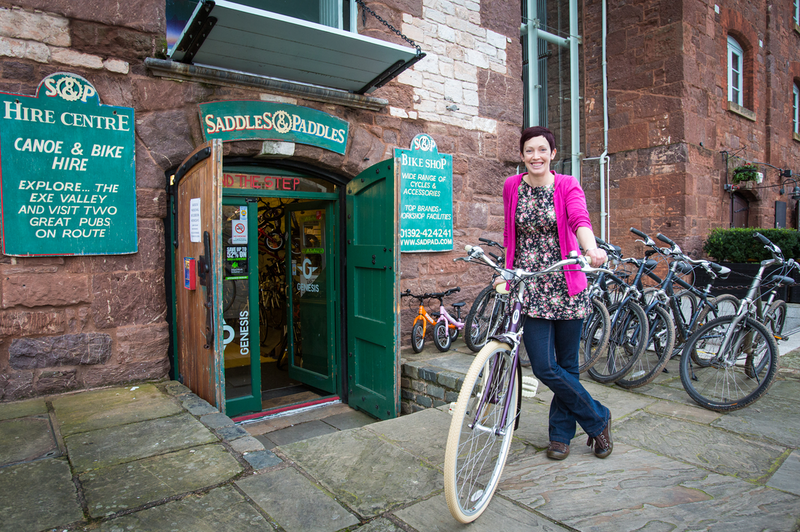 Saddles & Paddles has been on Exeter Quay for around 25 years and over this time, has built up a strong reputation as the place to go for bike hire or canoe hire. The business is extremely popular with both tourists and local residents, and our position directly on both the canal and the traffic free Exe Estuary Trail cycle route, makes us an ideal location for the hire of bikes and boats. We are also well known for specialising in family cycling - our position directly on the traffic free river cycle route lends itself perfectly to families keen to cycle. Our range of hire equipment for children, which includes child seats and trailers, allows the whole family to cycle together. The ability to be able to ‘test ride’ cycling as a family on wide, traffic free cycle paths is vital when building up confidence. As a bike shop, we are well known for our eclectic range of top brand bikes and our customer service – as an independent bike shop, and as keen cyclists ourselves, we will always take the time with each customers to fully understand your needs to help find the right bike for you. We pride ourselves on having experienced staff with a genuine love of Devon and the outdoors and we are always happy to spend time with our customers, whatever their needs. We all ride bikes and several of our staff are qualified paddlesports instructors, so that we can help you with both your pedalling and your paddling! And with a female owner (Heather Baker) and female staff that all love their bikes, it’s not surprising that we also specialise in women’s cycling – stocking a range of female specific bikes and clothing, but also understanding the needs of women on bikes. Heather took over the shop in a bold career move from the public sector – having spent 10 years previously working for Local Authorities in Devon on transport and tourism projects. Within this time, Heather spent 6 years as a lead officer on a national project to develop Exeter as a “Cycling Demonstration Town”, resulting in an excellent knowledge of the profile of cycling in the city. This innovative project saw Heather leading on future developments for cycling infrastructure, developing new programmes and forging working relationships with local businesses, schools, the public and bike retailers, and leading on cycling development projects nationally. Heather loves cycling, whether it’s tackling tough climbs on her road bike, thrashing around trails on her hard tail mountain bike or cruising along the Exe Estuary Trail on a basket bike.